Translated from German to English by Catherine Winkworth in Lyra Germanica, First Series, 1855. These verses, though sung as a separate hymn, are only part of Winkworth’s translation (verses 7, 9, 10, 13, 14, 15). From Heaven Above to Earth I Come is the full hymn. Music: "Vom Himmel Hoch," "Melody attributed to Luther; Geistliche Lieder, Leipsig, 1530"
1. Give heed, my heart, lift up thine eyes! Who1 is it in that manger lies? Who is the Child so young and fair? The blessèd Christ Child lieth there. That sweetest, dearest cradle song. To all the earth a glad new year! 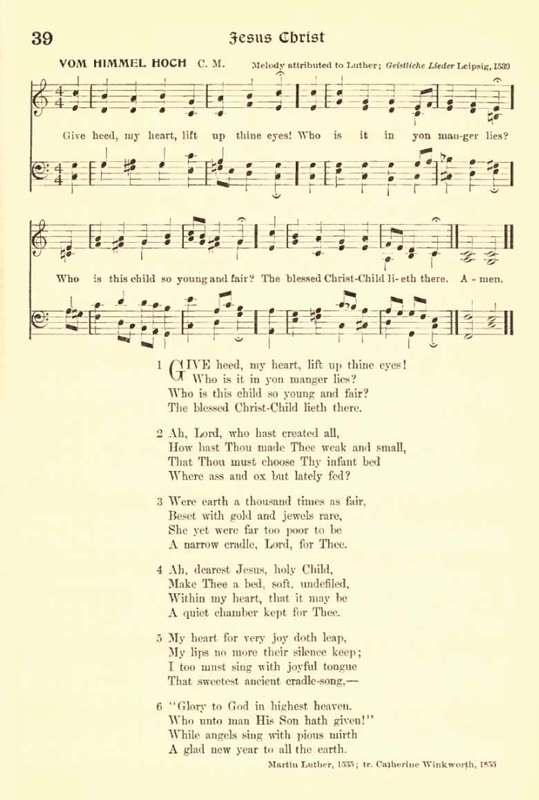 Sheet Music "Vom Himmel Hoch" from Henry Sloane Coffin and Ambrose White Vernon, eds., Hymns of the Kingdom of God. New York: The A. S. Barnes Company, 1910, #39, p. 75. 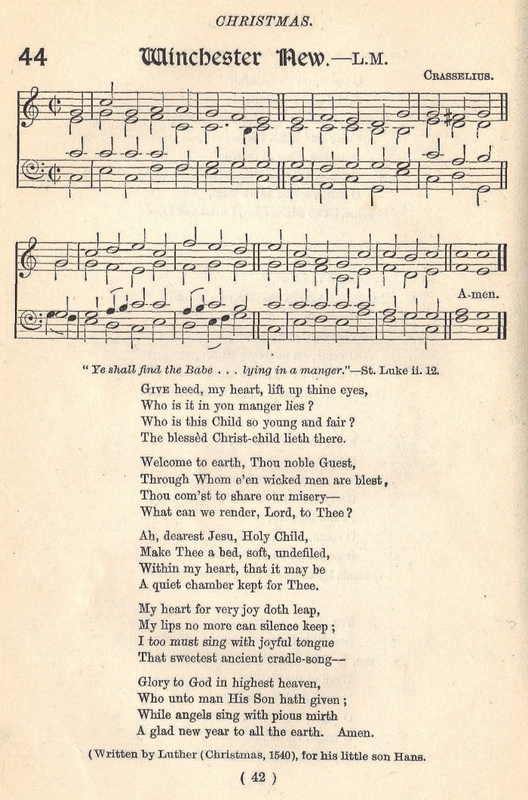 Sheet Music "Winchester New" by Crasselius from Mary Palmer and John Farmer, eds., Church Sunday School Hymn-Book (London: Church of England Sunday-School Institute, 1892), #44.